THE SUB® has an energy label of "A+". 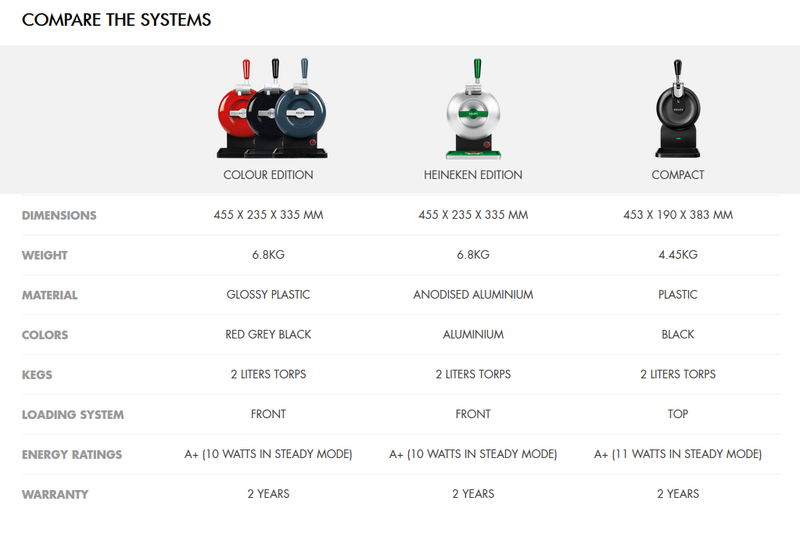 This means this is one of the most efficient appliances within the home draught system category. THE SUB® uses an average of 10 Watts in a “steady state.” This means the home temperature is 20-22°C, the TORP® is pre-chilled to 2°C, and THE SUB® is not pouring. It is comparable to an unopened refrigerator. 10 Watts is the same as a usage of 0,010 kWh per hour. THE SUB® Compact uses an average of 11 Watts in a “steady state”. On an annual basis, when THE SUB® is switched on all year, the energy consumption in the "steady state" is approximately 87.6 kWh. You can find an instructional video for cleaning THE SUB® here. You can find an instructional video for cleaning THE SUB® Compact here. TORPS® can be purchased on our website, they are not available offline. We also occasionally have deals on Amazon and Bol.com. The best way to cool the keg is in your refrigerator. To speed up the process, set your fridge at the lowest temperature and store the draught keg on the lowest shelf (this is the coldest area). 6.1 What are the advantages of an account? 6.2 How can I update my personal information? 6.3 How can I create an account? 6.4 Do I have to create an account to place an order? 6.5 I can't sign in to my account. How can I reset my password? 6.6 I lost my account login information (username & password). 6.7 How can I delete my account? 6.8 How can I remove myself from your email list? 7.1 What payment options do I have? 7.2 Can I save my payment details for next time? 7.3 Where are my payment details stored? 7.4 Can you guarantee that my payments will be secure? 7.5 When trying to place an order, I receive a notification that payment is not possible. 7.6 Who can I contact if the price on my invoice does not match my order total? 7.7 I have a voucher, but it is not working. 7.8 Where can I find my invoice? Standard delivery through PostNL is within 1-2 working days when ordered before 4pm. Delivery speed is dependent on shipping address. If you order above €45, you will get FREE standard shipment. Yes - You can have your order delivered wherever you like within the Netherlands. You can save multiple addresses in your profile for easy access in future. Krups® grants a two year warranty on THE SUB®, starting from delivery date. Claim of warranty may lead to repair or replacement. You may return your unused SUB® within 30 days for a full refund (see article 11.10). In case your SUB® needs to be repaired, we will provide you with a return label so no costs are incurred by the customer. Repairs on average take between 14 to 21 business days starting from the day we receive your device at our repair centre. More information about the warranty can be found in our Terms & Conditions. The Krups® International Limited Guarantee can be found here. In case of questions or comments please contact our customer service. We are available Monday - Friday from 10am - 5pm. You can contact us by calling 0800 2255843782 (free) or by e-mailing "contact@the-sub.nl".